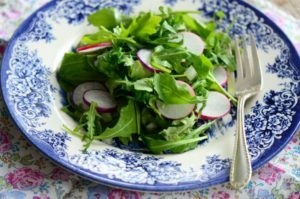 So how many of us would ever say that the radish is our first vegetable of choice when it comes to getting stuff for a salad? What, no hue and cry to promote national radish day or to liberate all the radish recipes that have been imprisoned by those renegade rutabagas and turnips who hog the recipe spot light? Crunchy super stars they can be white, red, purple or black and can be long short, narrow fat or even round. They are typically eaten raw in salads but them hardier varieties can be steamed, sautéed or pickled. 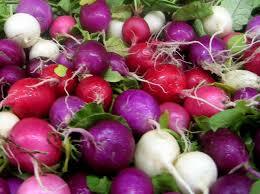 Look for radishes that are firm and brightly colored. If available don’t buy the prepacked kind, buy radishes that have the tops still attached. The tops should be fresh not wilted or browning. Even though the common thought is to discard the green tops they are actually edible and nutritious and they should be washed well, chopped and added to your salad. Some of my foodie friends even saute them like spinach. However, when you get those lovely little radishes home chop off their tops right away and store them separately because they will drain the moisture from the radish,. Do not wash either the tops or the bulbs until you are ready to use them and store them separately in the refrigerator in sealed plastic bags. The following recipes are perfect for any side dish this summer and wonderful if you’re looking to have something different to serve during the 9 days. Heat 1 tablespoon of oil in skillet. Add pumpkin seeds and cumin and cook, stirring, until lightly toasted 3 to 5 minutes. Immediately place the seeds on paper towels, season with salt, and let cool. In a bowl combine the lemon juice, honey, pepper, and 3/4 teaspoon salt. Whisk for about 1 minutes then slowly whisk in the remaining oil (you can also place everything in a jar with a tight lid and shake vigorously for 1 to 2 minutes).